A friend and I bought a lamb a while back. We each received about 25 pounds of organic, all natural, pasture raised meat from the animal. Yum, I love lamb! My half included 8 pounds of ground meat, 2 pieces of rack, 12 nice thick loin chops, 2 shoulder roasts, 2 leg roasts, 2 shanks, and two breast pieces (my friend gave me hers). One of the not-so-good things about getting a big ol mess of meat like this is that you end up with parts you would never buy, let alone have any idea of how to cook. In the case of our little lamb, I got two pieces of breast. I looked at this meat like a blocked writer looks at a keyboard. For so long as it has been in my freezer, I’ve been looking at the strange, frozen hunks of protein and skipping right along to the burgers or the chops. I don’t have a dog anymore or I would have boiled it up for her. When I took out cookbooks looking for help, there was none. 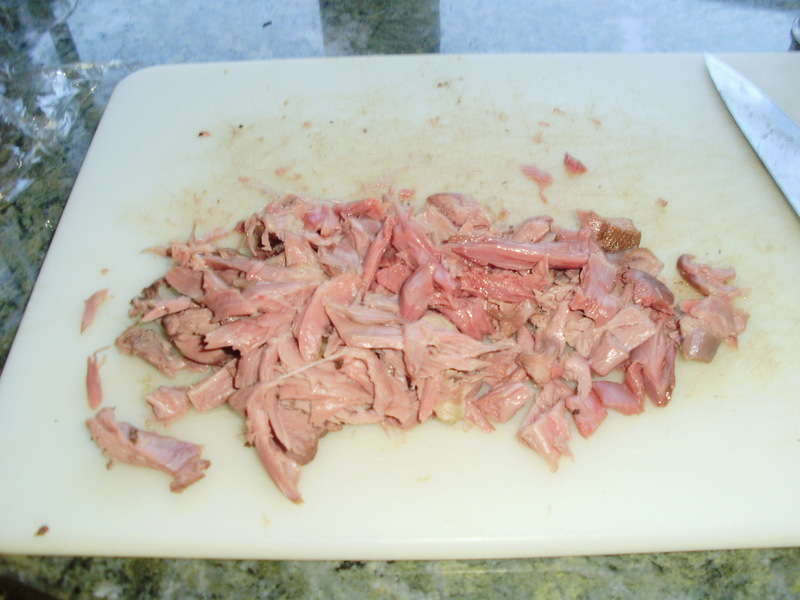 And, when I did what I do best, i.e., comb the internet, I found total lamb breast (aka belly) nothingness. I have to be honest and tell you my bad attitude is tainted by having watched an experienced chef-who-shall-remain-nameless fail miserably at several different tries with this stuff. He could not tame this sinewy, only moderately meaty lump of lamb. He worked with the boned out version. He rolled and roasted it, he braised it, he cooked it slow and low in the oven. It was still a disaster. In fact, it was so bad the guests he fed it to were embarrassed for him. In contrast to the breast pieces, I was anxious to cook up the lamb shanks, especially now that I finally had the Sous Vide Supreme. So what did I have to lose by throwing those breast pieces in there along with them? I seasoned everything with some kosher salt, and then to the breast pieces added garlic powder, fresh rosemary and a whole mess of cumin. In envisioned a very middle-eastern sort of flavor. 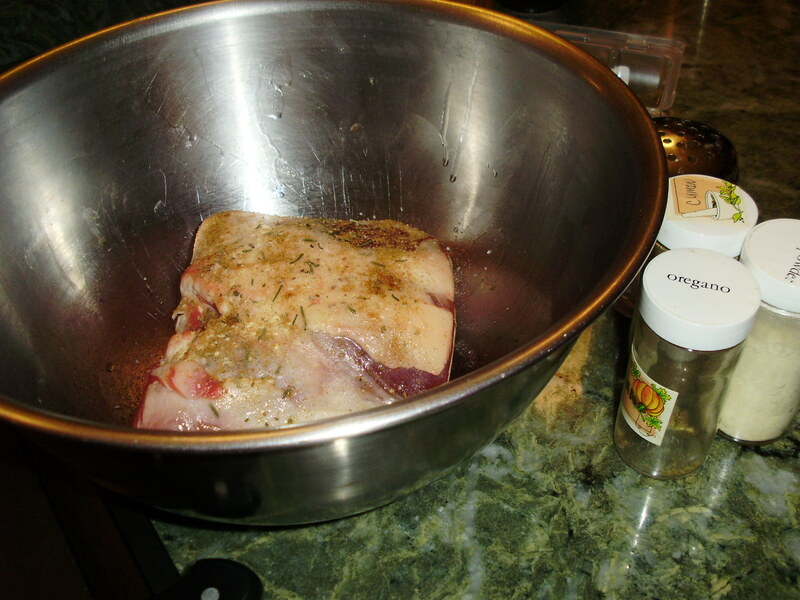 I used garlic, dried oregano, fresh rosemary and thyme for the shanks. 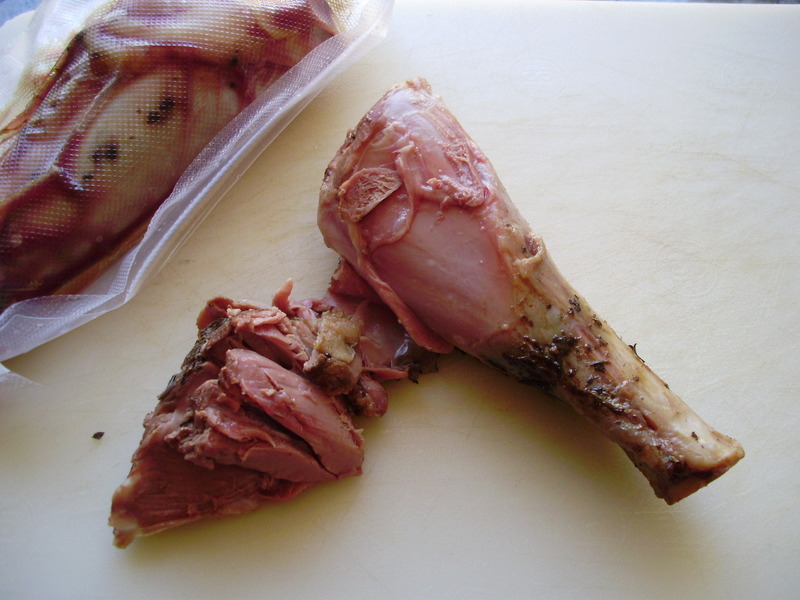 I bagged up the two chunks of lamb breast and the two shanks, individually and placed all four pieces in the SVS at 60 degrees C. This would be a real adventure – we will see what tomorrow will bring. I planned to leave the shanks in for 24 hours and, having absolutely nothing to lose, I decided to go for 48 with the breast pieces. In that amount of time I hoped that the collagen would be all broken down and everybody would be nice and tender. I was able to get a really good seal around the lamb pieces even though they are shaped so irregularly. The pros put down the Foodsaver because it does not get as strong a vacuum as you might like. 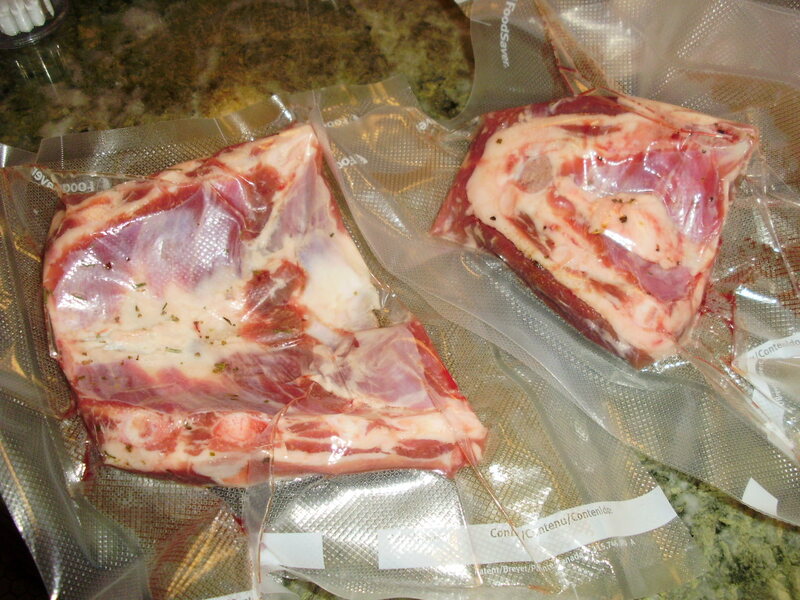 But most of us at home have neither funds nor space for a chamber-type vacuum sealer. The plebian version will just have to suffice. You can get a good enough seal out of the Foodsaver by using plenty of plastic and manipulating it to hug the contents as the vacuuming is taking place. The breast is curved so I held the plastic tight along the curve so it would keep good contact with it. It was the shank of the evening (I was dying to say that) 24 hours later when I reached into the water bath with my bear fingers and pulled out these puppies. I was I little nervous. I have braised (osso buco style) many a lamb shank slow and low in my oven and it was always a challenge to keep the meat on the bone. 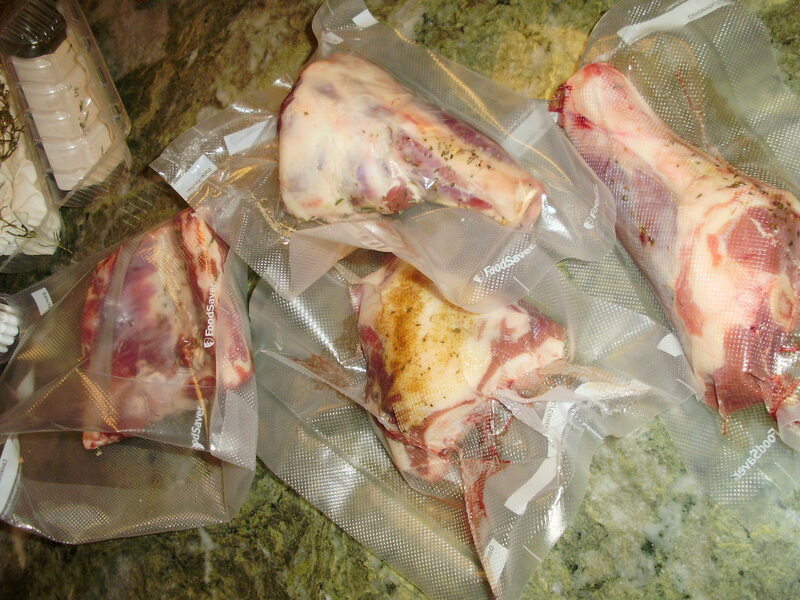 But when I took these sous vide, slow cooked shanks out of the plastic, nothing fell apart. To tell the truth, I really did not expect it to fall apart but it is still an amazing thing when you first experience this. The meat was soft, extremely flavorful and a beautiful medium rare. There was very little juice in the bag but definitely more than with the chicken. I poured this juice (from both bags) into the sauce I was preparing for this fantastic meat. 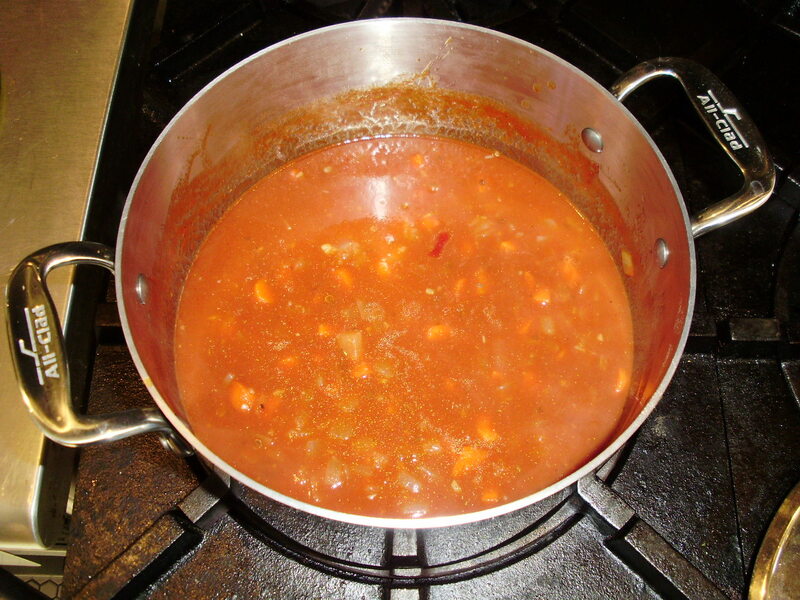 The sauce, made from a base of veal stock, had San Marzano tomato paste, mirepoix (sweated first with butter and then deglazed with red wine) and a little salt, had been simmering for about and hour. 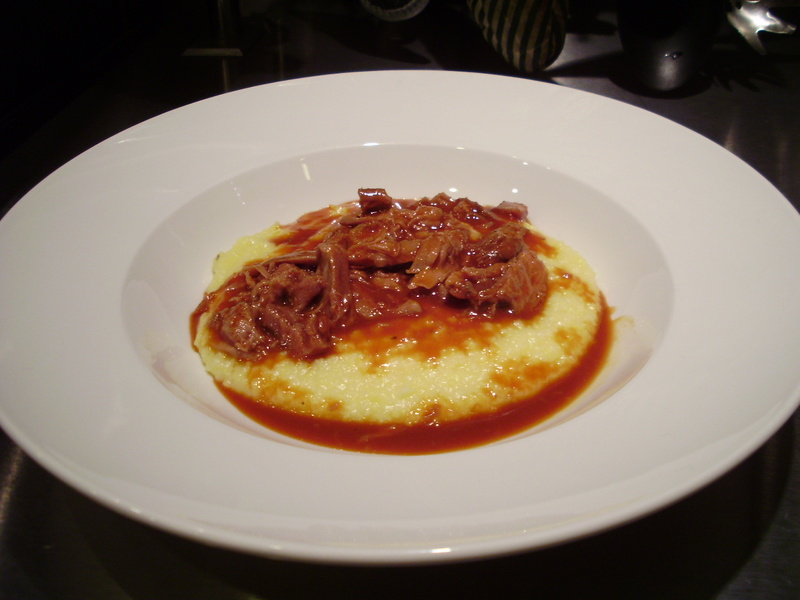 It was rich and aromatic but when I added the juice from the meat, it came together beautifully. I was getting very excited about this experiment – I could tell it was going to be good. I pulled most of the meat from the bones with my fingers and the rest had to be tamed with the knife. Then I strained the sauce through a chinois, put it back in a clean pot, reheated it with the meat. I was very careful to only briefly reheat the meat, not wanting to do anything to ruin the wonderful texture and flavor it had right out of the SVS. I made up a pot of creamy polenta (thank you muse Lydia for suggesting I add bay leaves to the pot when making polenta) to serve the meat on top of. I was going for a kind of Mediterranean comfort food. Ok, so I’m not going to tell you what happened with the breast, quite yet. It was good! Come back soon! I might have to look to getting a SVS, although I really have no room in the kitchen for one. I rationalized that the SVS could replace the crock pot which I only use for pulled pork and stock. I was never happy with the fact that you can’t really control the crock pot temperature. 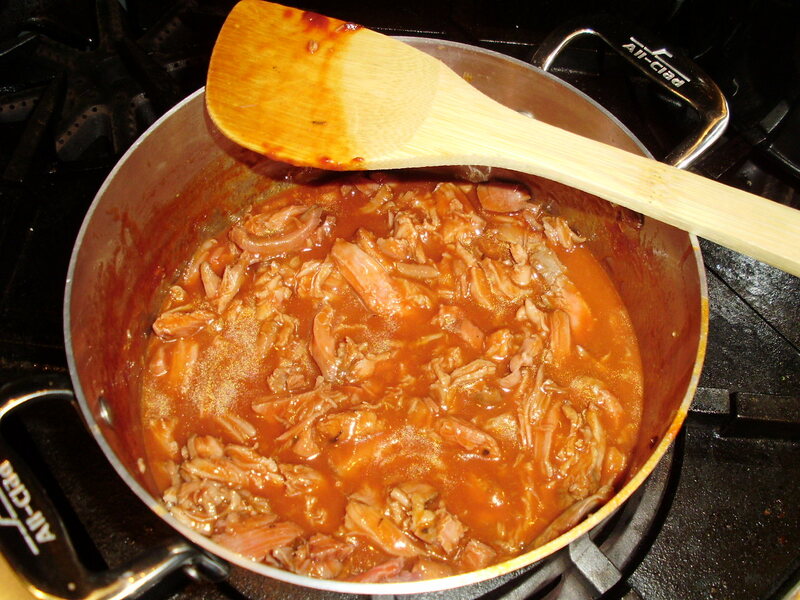 I can make stock on the stove top – I just do it in the crock pot to give the crock pot another use besides the pulled pork! I have not made pulled pork yet in the SVS but it is certainly on the to-do list. I just cooked mine at 78c for 24 hours and it was perfect. I used some Jamie Oliver tips – cut along the bone and rub in some butter, garlic and rosemary. I poured off the stock, added some red wine and fancy garlic and onion pasta sauce, and reduced it till thick. The meat just melted in my mouth, the connective tissue was sweet and soft, and most of the marrow seems to have leaked through. it looks fine however when opening in IE, it’s got some ovedrlapping issues. I merely wanted to provide you witgh a quick heads up! Besides that, wonderful site!